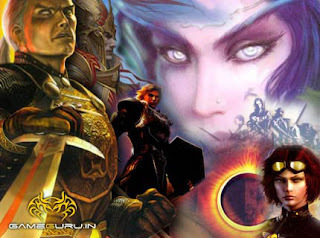 Back in the day, Everquest was the hot game on the market. I can’t recall all the times I would hear people in electronic stores talking about their new addiction that was slowly being known as Ever Crack. I resisted for a very long time, feeling that if I wanted to play a game on line, why should I shell out a monthly fee when a majority of multiplayer games, like Quake 2 and the new Unreal tournament, came with free online play. I finally, like all of us, got talked into playing EQ by peer pressure. The lure to simulate a session of dungeon and dragons with many of my college friends through on line play across various states, to bring back the luster of the old days was just too good to true and I just had to give it a try. Besides, the guy that ended up talking me into it was a high level jedi and knew how to work the mind trick to his advantage. I played for about 2 or 3 yrs. I really can’t tell you the correct number because I was spending all my time trying to level up my barbarian shaman and didn’t keep track of the time I was spending. First mistake when buying into the whole MMO atmosphere, never forget how much time your spending away from real life, but that’s another discussion. But for me, Everquest was the “IT” MMO game. I’m sure others talk about how great Asheron’s Call was or Ultima online, but as far as advertising in stores, magazines and word of mouth, Sony’s Everquest was getting all the hype and promotion. Sony was on top of the MMO world and continued that trend by releasing expansion after expansion. Adding new content on a regular bases to keep the consumer spending and happy. Sure, a lot of stuff had to be fixed because the expansions themselves would either break the game or the game got broke after someone exploited a piece of code to their advantage and developers would have to fix the issues, but at least Sony was trying to get stuff out to the paying customer on a yearly bases. SoE was on top of the world. No one could touch their subscription numbers, they were the it company. They added a few more games to their stables, like Planet Side to sweet’n the monthly charge. All an effort to keep the customer happy and subscribing to that monthly fee. Then the inevitable happened. While SoE was developing their next step forward in MMO’s another company slipped in the door and took the spotlight away. SoE made the fatal mistake of assuming that MMO customers will stay loyal no matter what comes out on the market even if your doing your best to turn out the next exciting product. I was that interested in EQ2 but not fully committed to the concept of future proofing, as it came to be called. But, I had a good, wealthy friend friend purchased and then shipped the game to me, so there was no excuse for me not to give it a try, especially after having been a loyal EQ player for so long. But to their own fault, SoE made the game too graphical and hardware dependent. Players, who had spent years playing EQ, just were not ready to spend up to $2,000.00 upgrading their computers just to play a re-envisioned version of EQ. So one has to ask, if Sony hadn’t made EQ2 so graphical heavy, would they still be on top of the MMO industry? I honestly don’t know and this is why. Recently, I’ve become bored as many others have, with WAR. So, I’m probably going to give it up, but I just don’t want to rely on WoW for all my online entertainment. I considered giving EQ2 another shot at some of my hard earned dineros. But when I ventured out to pick up the newest expansion, The Shadow Odyssey, I couldn’t find a copy. I searched, Wal-Mart, 2 different Target stores and Circuit City, nothing EQ2 related was to be found. There were plenty of Age of Conan, WAR, LOTRO and even some Tabula Rasa copies, but nothing, unless you count the EQ Anniversary box, on EQ2. But here is the strange thing and why I think the stores are very bias. Every store had a Wrath of the Lich King display. If they didn’t have a display, they had tons of game copies and monthly game cards. The idea came to mind that either Blizzard is pay graft to get their product displayed heavily in stores or the market has already decided who the king is and it’s WoW. Whether tons of people are playing EQ2 or not, shouldn’t that game be available and readily at hand for any consumer to purchase without having to be bombarded with Blizzard’s Lich King? I finally found a copy at Best Buy, but even there, they had a huge display set up for Lich King, but no display or massive shelf space for the EQ2 expansion, and it was just released as well. So, apparently the market has spoken. Even if your not a gamer, the public recognizes WoW as the winner of the MMO wars. Second I would have to say a tie between Lotro and WAR, followed by AoC then the dead Tabula Rasa. EQ2 is far behind in market recognition and considering that SoE was the big dog several years back, with EQ being top of brand recognition, it’s a pretty sad state. So what happened? Did Blizzard just throw a war chest of money at the marketers and say, “We want everyone to know who we are, we don’t care the cost.” Or is EQ2 that bad of a product that players just can’t find a place for it in their MMO hearts anymore? The irony of going from the industry name for MMO’s to having a small amount of shelf space for one or two copies of their current mmo titles was just shocking. Did Blizzard just pass out a lot of kool aid in department stores on day or is SoE’s EQ2 just that far back in consumer’s minds that they don’t deserve any floor space? Either way, it’s pretty sad for a company that was riding the high not so many years back. As a side note, I didn’t provide any links to Blizzard or World of Warcraft in this post. ~ by oakstout on December 7, 2008. So I had originally tried Everquest, Ultima Online and Asheron’s Call when those were three big MMO’s around. I didn’t play any of them more than a month, not entirely sure why. Of the three I found Ultima Online the most polished and it captivated me the most. One day I was in a game store, and I saw a game on the shelves called Dark Age of Camelot. It looked interesting, and when I discovered by reading the box that it was a MMO, it pushed me over the edge to buy it. I played DaoC for about 3 years or so, off and on. Eventually I got tired of it (but has SO many fond memories). A new MMO was coming out, World of Warcraft, and Everquest 2 about the same time. I still haven’t opened up my EQ 2 box. At release and for a few months after release, I kept hearing about how EQ 2 wasn’t all that good. Bugs, questing issues, end game, performance problems, etc. WoW had that too, but WoW had some sort of ‘addictive juice’ that drew me in. Something about the polish of WoW, something about it just pulled me back day after day. DaoC had something special about it too, something that caused a lot of players to keep logging in. All the other MMO’s, they just don’t have that juice. Not EQ2, not LotRO, not WAR. At least, not for me and judging from population levels, not a lot of other people either. EQ2 got the juice I crave for! And the new expansion is awesome. Perhaps it takes awhile before one get sucked into the world of Norrath, but once in the lore, the lands and the adventures get to you.